Leading global firm in water, hygiene and energy technologies and services Ecolab Inc. has launched a free online tool to help businesses throughout the world improve water management at their facilities in the face of growing global water scarcity. According to U.N. projections, the world will experience a 40% water shortfall by 2030 unless action is taken to reduce global water use. Industry accounts for 20% of all freshwater use globally and more than 40% in developed countries, and use is trending upwards in developing nations as they industrialize. The Smart Water Navigator has been developed in collaboration with Trucost, part of S&P Global, and an advisory panel of major private sector companies. More and more companies have water reduction targets, but they often lack the tools and expertise to achieve them – the tool is intended to help bridge this gap. Based on a straightforward, 13-question assessment, the Navigator shows companies how their individual facilities are performing compared to industry-leading water management practices. The tool places each facility on a Water Maturity Curve, and generates an industry- and location-specific guide with practical action steps to help a company build sustainable, “water-smart” practices and achieve the next level on the Water Maturity Curve. According to Emilio Tenuta, Ecolab vice president of Corporate Sustainability, because every location and every watershed is different, corporate water use must be tackled at the individual facility level – which is where transformational action is lacking. Last week Ecolab and GreenBiz released new water conservation data on World Water Day which highlighted the disconnect between the corporate level, where the goals are set, and the on-the-ground facility level, where the actual savings must be achieved. 86 companies across a variety of industries (consumer, agriculture, industrial, healthcare, technology, etc.) were surveyed about their water usage and conservation goals. 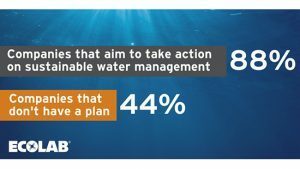 For 74% of the companies, water is becoming an increasing priority – however, 44% of the companies surveyed said they have no plan in place to achieve their water goals. 59% of respondents agreed that water scarcity is also a growing business risk – but even with this growing focus, only 56% of those surveyed said they use smart technology to track against their goals. The findings suggest there is a disconnect between those setting the goals and those expected to meet them – with 75% of companies saying that water reduction targets are set by corporate sustainability teams, but only 64% feel that they are appropriately engaging their facility teams to achieve their goals. Looking at specific sectors, the survey found that 40% of agriculture companies have water-related targets versus 75% average across other sectors – with consumer goods (94%) and healthcare (89%) leading. However, in terms of which sectors are leveraging measurement tools to track water progress agriculture leads along with materials and consumer goods. The Smart Water Navigator can be used by companies in all sectors of the economy, whether they manage one facility or hundreds, to improve their water management. With nearly three million customer locations and annual sales of $15 billion, the tool builds on Ecolab’s expertise in water management. It complements the Water Risk Monetizer, a tool Ecolab launched in 2014 to help companies understand the real value of water – which is often significantly higher than the water bill – to their business.